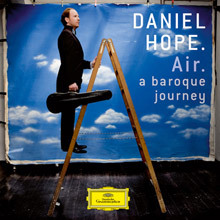 Described in his publicity materials as "the British violinist," as if he were the only one, Daniel Hope is at least the most versatile British violinist of the early twenty-first century. An advocate of contemporary music, he has also performed Beethoven and Schumann with the period-instrument ensemble Concerto Köln, recorded music inspired by Indian classical composer-performer Ravi Shankar, and partnered with actor Klaus Maria Brandauer in conceptual projects involving music and the spoken word. Hope's father, poet and novelist Christopher Hope, was persecuted in South Africa for his anti-government views, so the family fled to England when Daniel was six months old. His mother, Eleanor, got a job as secretary to Yehudi Menuhin. Daniel became a playmate of Menuhin's grandchildren, and although the old master was not a significant figure in the boy's life, he did inspire Daniel to take up the violin under the supervision of neighbor Sheila Nelson, one of England's top violin teachers to children. Hope went on to study with several Russian instructors at the Royal College of Music, then traveled to Hamburg to study from 1992 to 1998 with another Russian, Zakhar Bron. He also took degrees from the Royal Academy of Music in London. As a student in Hamburg, Hope developed a friendship with composer Alfred Schnittke (in 2003 he was entrusted with the premiere of the composer's recently discovered violin sonata from 1955), and would soon devote himself largely though never exclusively to the music of Schnittke and other living composers. He has commissioned works from the likes of Jan Müller-Wieland, Huw Watkins, and Roxanna Panufnik. Hope's career began to take off in his mid-twenties, and in 2002 he was recruited on one week's notice to perform on tour with the Beaux Arts Trio. Almost immediately he was accepted as a permanent member of the ensemble and worked to spice up the group's fairly conservative repertoire with commissioned works by such composers as György Kurtág and Mark-Anthony Turnage to celebrate the trio's 50th anniversary. Hope continued to perform and record as a soloist; in 2004 he won three major awards for his recording of the Berg (in its original version) and Britten concertos. He also serves as associate artistic director of the eclectic Savannah (Georgia) Music Festival, and since 2010 as Artistic Partner at Festspiele Mecklenburg-Vorpommern. In 2004 he married double bassist Annika Pigorsch, a player in the Radio Symphony Orchestra in Amsterdam, the city where Hope has made his home base. Hope has also written three books, as of 2011, about his life and about music, and has hosted radio and television programs about music. 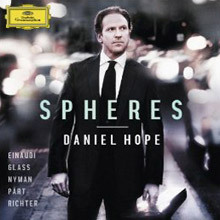 He should not be confused with Daniel Hope, an American composer, born in 1972 in Baltimore, MD. "This album is a tribute to the 19th century violin of Joseph Joachim (1831-1907), the performer and composer. 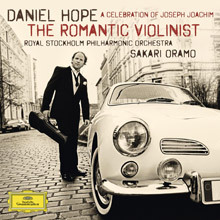 It features violinist Daniel Hope with the Royal Stockholm Philharmonic conducted by Sakari Oramo. The central piece is Bruch’s ‘Violin Concerto’ – the violin part which was completely reworked at the composer’s request into the piece we know today. The recordings also feature a number of works dedicated to Joachim including Brahms’ ‘Wiegenlied’ sung by Anne Sofie von Otter." "Daniel Hope’s recording of a number of eclectic and accessible pieces of neo Baroque, minimalist and soundtrack favourites from contemporary composers like Karl Jenkins, Max Richter, Ludovico Einaudi, Gabriel Prokofiev and Michael Nyman. This is music which is sometimes totally new, sometimes old and forgotten gems. A magnificent recording, this comes highly recommended to the listener of quality expression." 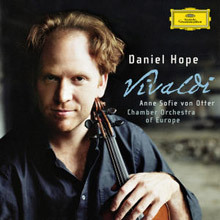 Daniel Hope and The Chamber Orchestra Of Europe’s recording of some of the great works for violin by Vivaldi. Although they are not performing on period instruments, they all play with remarkable energy. One of the standout pieces ‘Sovvente il sole’ from Adromeda Liberate – where Hope is joined by Anne Sofie Von Otter. “Enthusiastically recommended” by leading reviewers. Violinist Daniel Hope takes you through a journey of over 150 years of a revelation in music. A mixture of popular works and also lesser known pieces, it follows the story of four unique composers – three of whom were Virtuosa violinists who spent time during the 17th and 18th centuries looking for musical inspiration playing at the Court of Kings while travelling around Europe. Those composers are Falconiero, Matteis and Geminiani from Italy and Westhoff from Germany. The album also includes a work by Bach, Daniel Hope’s inspiration and hits like Pachelbel’s ‘Canon’ and Handel’s ‘Sarabande’. 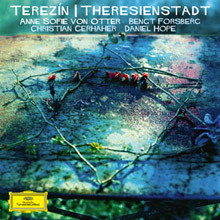 The idea for this collection of music written by prisoners at Theresienstadt, or Terezín, grew out of Anne Sofie von Otter's performance at the 2000 International Forum on the Holocaust. The music here represents only a small fraction of what was written and performed at the camp, much of which has been lost. Terezín served as the Nazi's model camp, in which artists were allowed to create new works put on display for the international public as a proof of the humane treatment of prisoners. The performances only masked the hard labor and malnutrition the prisoners suffered when they were not on public display, and most of them died there or went to their deaths in other camps. The awareness of the tragedy behind the music heightens its poignancy. Perhaps most moving are the songs that directly address the prisoners' suffering -- Ilse Weber's "I wandre durch Theresienstadt" and "Ade, Kamerad!, Karel Svenk's "Anything goes!," and the bitterly ironic "Terezín Song," set to a merry tune from the operetta Gräfin Maritza. Weber's songs have the sweet simplicity of Schubert, and her lullaby, "Weigala," which she sang as she joined a group of children being taken to their deaths, is almost unbearably poignant. The works by the best-known Theresienstadt composers -- Hans Krása, Viktor Ullmann, Pavel Haas, and Erwin Schulhoff -- are at an entirely different level of compositional sophistication than the folk-like or cabaret style songs of the others, but they are no less deeply felt. The performances are uniformly of the highest quality. Von Otter and baritone Christian Gerhaher sing with extraordinary purity, tonal radiance, and intensity. Pianist Bengt Forsberg accompanies them with comparable eloquence and sensitivity. Daniel Hope gives an impassioned performance of Schulhoff's Sonata for solo violin. Deutsche Grammophon's sound is clean, lively, and present, with excellent balance. This is magnificent. The sound is superb, the violin playing is spine tingling and the orchestra one of the most characterful I've ever heard in the concerto. 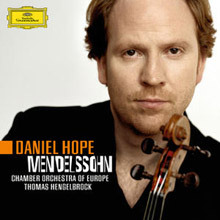 Hope plays Mendelssohn's original version of the concerto, without the alterations made to the solo part at the behest of its original soloist David. The differences aren't huge, but it will make you sit up and listen a couple of times in the first movement in particular. Hope's playing is wonderful. Light but masculine, precise hairpin turns and full of character. Hengelbrock's orchestra is every bit as good, and match Hope's every twist and turn with perfection. Trumpets and drums are a little more to the fore than usual and only help to add to this most characterful performance of the concerto I have ever heard. This disc will make you listen to this old favourite with new ears. The coupling of the sublime Octet is ideal. Hope is very much the star of the show here too, and the performance is as good as any I know.